Wasatch Speech and Language Center is a premier full service clinic serving the needs of children and adults with communication disorders since 1989. Our ASHA (American Speech-Language-Hearing Association) certified speech language pathologists can evaluate and treat a variety of speech, language, and swallowing disorders. 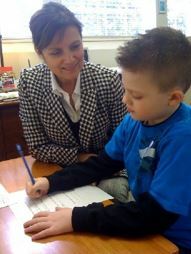 We are board certified in Fluency Disorders/ Stuttering treatment for children and adults. We specialize in the evaluation and treatment of stuttering disorders, motor speech disorders, i.e. childhood apraxia of speech, auditory processing and language disorders. In addition, we treat children with Autism Spectrum Disorders and Down syndrome. A wide variety of effective treatments are available. Our clinic serves all ages from two years of age to adults with a variety of communication disorders. Some of our clients are involved in treatment programs through their school districts. These clients are seeking additional services to benefit from the intensity of therapy and the expertise that our clinicians can provide within our center. Coordination with the client's school therapist can help maintain consistency of treatment and provide a level of progress that would not otherwise be possible. If your child is currently receiving school based therapy, ask for a copy of their individual Education Plan (IEP) to bring to your first appointment. In addition, we contract with private schools to provide speech therapy services. This may be an option for your child to participate in therapy that is more convenient to the child's schedule. We have expertise in articulation, phonological, motor speech, such as childhood apraxia of speech, stuttering and language disorders. In addition, we have expertise in swallowing/ dysphagia disorders and acquired adult language (aphasia) or cognitive dysfunction from head injury or stroke.